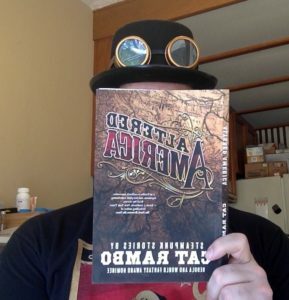 Altered America by Cat Rambo is an excellent collection of steam punk stories combined with the supernatural. The little details are charming such as, the new release of the heretical Origins of the Species by Charles Darwin and the women’s suffrage. Male suitors suddenly find their attempts to woo women thwarted by new radical ideas of independence. I really enjoyed Clockwork Fairies and Memphis BBQ. They were charming stories, and I loved the description of the Goblin Market and mechanical automatons. Every story had the perfect length and was satisfying. I’m very happy with this anthology and recommend it to any fan of Steampunk and or fairytales. Overall, I give 5 stars.